Last week Harley unveiled the ninth iteration of the Big Twin, named the Milwaukee-Eight for Harley's hometown and the eight valves on the new engine (four in each cylinder). With 50 percent more intake and exhaust flow and a revamped cooling system that allows the engine to work harder without overheating, the Milwaukee-Eight produces 10 percent more torque than its predecessor, the Twin Cam, according to Harley. The 107-cubic-inch (1,750cc) Milwaukee-Eight is replacing the Twin Cam on Harley's 2017 touring bikes, including the Street Glide, Road Glide, Road King, and Electra Glide models. They will start arriving at dealerships around the country this week. The CVO Limited and CVO Street Glide will get the massive 114ci (1,870cc) version of the Milwaukee-Eight, and there is speculation that the 107ci engine will eventually become the standard on other bikes such as the Heritage Softail. That would be the first rubber-mounted engine on that classic design. 2017 Harley-Davidson Street Glide with the 107ci Milwaukee-Eight. "We want all riders to save the date of Sept. 23," said Dino Bernacchi, Director of U.S. Marketing at Harley-Davidson, in a press release. "That weekend, Harley-Davidson dealers across the country will host open house events so riders can throw a leg over our Model Year 2017 touring motorcycles and feel the difference of the all-new Milwaukee-Eight engine for themselves." The primary upgrade to the Big Twin is "strategic cooling" technologies, the result of thousands of hours of predictive computer modeling. The engine will produce more power, so it's going to generate more heat, thus the need for clever cooling tricks. Coolant is pumped through a heart-shaped passage that wraps around the "exhaust bridge" that separates the valves of each cylinder head—a small metal section that is heated from both sides of the combustion chamber. In addition, the shallow, four-valve combustion chambers of the Milwaukee-Eight absorb less heat than the deep, two-valve, modified hemi chambers used on the Twin Cam. The new shallow valve design combined with faster combustion from two spark plugs per cylinder keeps some heat from being absorbed by pistons and heads. This traps the hot gas in the combustion chamber where it translates to power and torque. A redesigned exhaust system and large-area cooling fins displace that heat away from the rider and passenger. The new engine also cuts down on mechanical noise by replacing old gear configurations with a drive that uses a chain and automatic hydraulic tensioner. The reduced number of moving parts means less noise and lower friction, and it also means the engine will have a slightly different sound. As Harley told Cycle World, "We're killing the noise so we can keep the music." A challenge for large-displacement two-cylinder engines has always been smoothing the short bursts of torque into a steady rate of acceleration and a smooth ride. To accomplish this, the electronic control module (ECM) of the Milwaukee-Eight was reprogrammed to interpret different throttle positions as calls for various amounts of torque output. Harley says it also used a counter-rotating internal balancer to negate 75 percent of the engine's shaking. When Harley cut down the engine shaking even more, test riders rejected the new completely-smooth idle, prompting engineers to purposefully retain some of that idle vibration that lets you know you're riding a Harley. Thanks to those upgrades, the Milwaukee-Eight can ran at high compression ratios—as high as 10.5:1. As a result, bikes equipped with the new Big Twin are two to three bike lengths quicker in a 0-to-60 mph sprint and one to two lengths quicker when accelerating in top gear from 60 to 80 mph, according to Cycle World. The new engine is being rolled out with a revamped suspension system that uses "dual bending valve fork technology" for a smoother ride without compromising control. When the fork is at rest, the damping fluid is partially blocked by a thin washer to keep the suspension more rigid for enhanced control. But when the suspension is compressed, damping fluid gradually moves the free edge of the washer out of the way to increase the volume of the flow path to allow more absorption of bumps in the road. The end result of all this engine tech is Harley striving for the best of both worlds. 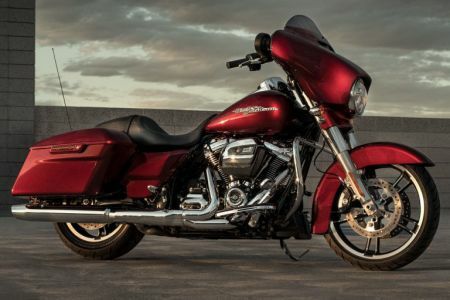 The smoother ride quality should appeal to a wider range of riders, though the Milwaukee-based motorcycle manufacturer intentionally retained some of the V-twin rattle that longtime Harley-riders have grown to know and love. With the entire touring line upgraded to the Milwaukee-Eight Big Twin, and an electric motorcycle on the horizon, what it means to be a Harley is something that's roaring into the future.